Description: The Taunton meeting of Catholic Churches will meet on Wednesday April 3rd. Everyone is welcome and encouraged to contribute. The meeting begins at 6PM. You do not have to be on a committee to attend. Hopefully if enough parishioners attend we can send a positive message to the Diocese. Description: Come and join us on Thursday nights at Our Lady of Lourdes School, 52 First Street, Taunton. Bingo begin at 6:30PM. We have sandwiches, chips, pastry, coffee, soda and water. We also have pizza for $1.50 per slice. Our BINGO is looking for some volunteers on Thursdays. Bingo ends by 9:30. Volunteer once a week or once a month. Any hours you can help would be greatly appreciated. We will have our Lenten Reconciliation Day this Saturday, April 6th from 9:00 a.m. to 3:30 p.m. Description: Sundays during Lent @3PM in the Church. Concludes with Chaplet of Divine Mercy. This is our biggest bake sale fundraiser of the year. Donations are needed, cupcakes, pastry, cookies, cakes, brownies. Blessed Palms will be distributed at all Masses this weekend. Saturday at 4:00pm Mass and Sunday at 8:30am Mass & 10:30am Mass. Procession of Palms at the 4:00pm and 10:30am Masses. Parishioners are invited to gather in the parish hall 10 minutes before Mass. Students in Faith Formation are REQUIRED to attend the 10:30am Mass. Description: Flower envelopes for Easter intentions are now available in your monthly envelope packet and at the doors of the Church. . Please have them in by April 14, 2019 so that your intentions will make it into the Easter Flower Bulletin. Documents for Seniors; Free Health Screenings, and many booths and exhibits. Flyers can be found at the doors of the church. 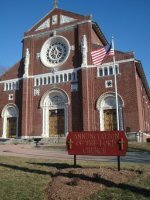 The Taunton meeting of Catholic Churches will meet on Wednesday April 3rd. Come and join us on Thursday nights at Our Lady of Lourdes School, 52 First Street, Taunton. Bingo begin at 6:30PM. We have sandwiches, chips, pastry, coffee, soda and water. We also have pizza for $1.50 per slice. Our BINGO is looking for some volunteers on Thursdays. Bingo ends by 9:30. Volunteer once a week or once a month. Any hours you can help would be greatly appreciated. Sundays during Lent @3PM in the Church. Concludes with Chaplet of Divine Mercy. Flower envelopes for Easter intentions are now available in your monthly envelope packet and at the doors of the Church. . Please have them in by April 14, 2019 so that your intentions will make it into the Easter Flower Bulletin. ©2019 Annunciation of the Lord Parish All Rights Reserved.